Shop Local: Support Neighborhood Toy Stores - Mamanista! Many of my favorite toys are on this list. As an infant, my son loved his Skwish and Sophie the Giraffe teether, and he falls asleep nightly to the soft glow of his Twilight Turtle. And Bananagrams is my favorite travel game. Since the ASTRA picks seemed so high quality, I was inspired to try the Wee Wedgits by ImagAbility. My toddler has spent hours playing with these soft blocks. He can stack them, chew on them, play with them in the bath, throw them and even wear them as bracelets. 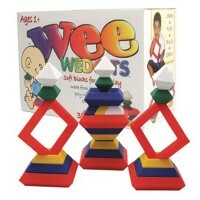 Wee Wedgits have smooth, rounded edges and are made from non-toxic, phthalate free poly-vinyl material. Children (and even adults) will enjoy building amazing geometric designs as well as simple stacking pyramids. Thanks to ASTRA and the folks at ImagAbility, we have a set of Wee Wedgits available to giveaway on Mamanista. WANT IT: Buy Wee Wedgits at your local ASTRA store. Click here to find a store near you. WIN IT: ImagAbility is giving away one Wee Wedgits (30 piece set) to a Mamanista reader to spread the word about the ASTRA Best Toys for Kids List. Additional Entries (up to three): You can receive up to three additional entries by linking to and/or sharing our Hottest Holiday Toys Guide (see rules at the bottom of the guide) and leaving separate comments on this post for each mode of entry. Contest on Mamanista.com ends December 3, 11:59 PM EST. Open to U.S. Shipping Only.